The new president of the Cato Institute wants the think tank to adopt the personal philosophy of Ayn Rand as policy. 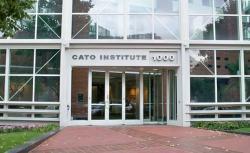 The new president of the Cato Institute wants to remake the think tank in Ayn Rand’s image. Photograph by Matthew G. Bisanz. On the afternoon of July 3, in San Diego, the annual Objectivist Conference came to order. Followers of Ayn Rand paid up to $735 for the whole shebang. No media joined them. So, when the panel on the libertarian Cato Institute’s future began, people felt safe to talk straight. John Allison took the stage, joined by Ayn Rand Institute President Yaron Brook. It had been only a few days since Cato ended a months-long conflict between Cato’s current management and the increasingly active mega-donors Charles and David Koch. The deal ousted Ed Crane, Cato’s president since its founding, in favor of Allison, the affable former CEO of BB&T. The détente, according to Cato brass, was partially engineered by Allison himself. Brook wasn’t overly interested in the spat. He wanted Allison to explain where Cato was headed. Two unaffiliated Randians in the audience, Earl Pearson and Arthur Zey, opened their phones and live-tweeted the conversation. This is the only public record anyone has of Allison revealing how he’d remold Cato in the Ayn Rand image. The way this strikes in the real world—the way it separates objectivists from other libertarians—is in foreign policy. Since the war on terror broke out, Cato’s been a bunker for non-interventionists. Its foreign-policy shop is staffed with critics of the Iraq war. And that was the context in San Diego, at the grilling of Cato’s new president. The Ayn Rand Institute has not made public any recording of the Q&A, though Jeremy Lott, who broke the story, has been asking after it for weeks. According to Pearson—one of the participants live-tweeting the event—Brook started the discussion with a reminder—the “old school” libertarians were “enemies of Objectivism.” Allison assured Brook that the Kochs were admirers of Rand. None of this should have surprised Cato-ites. Allison had been involved with the Ayn Rand Institute for years, and starting in 2009, he’d stepped up his public schedule and given talks about how Atlas Shrugged was coming true in Obama’s America. He’d appeared in a documentary about this, and he’d written one of the introductions to a businessman’s-guide-to-Rand book by Ayn Rand Institute scholars. And that’s all Allison’s said about the San Diego panel. “My e-mail was intended as a private communication to the Cato staff,” he wrote when I reached him last week. “I do not see any benefit in discussing it further at this time.” The Ayn Rand Institute’s Brook is out of the country; the live-tweeters have kept their opus online but decided against saying more. But what else should Allison, et al, say? He’s never tried to cover up his Objectivism. In 2001, after Peikoff published newspaper ads making the “end states” argument, he posted in a Randian message board about how it came together.